I think the Apple identity system is very effective and recognized everywhere. 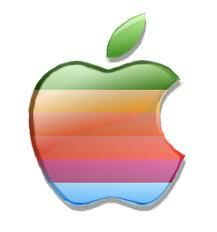 The logo is very simple but works for advertising and supporting the products that Apple produce. Their products have become a huge demand that most people aspire to posses. Technology today is dependent on Apple product. Between the iPhone, iPod, iPad and Mac Computers its amazing how so much is supported by one company. Apple is the biggest competition out there, and very few can compare or come close to topping them. I always thought the concept was interest for the logo, simple but effective. First the computers were known as macintosh with the rainbow ‘macintosh apple’ but now the name has been shorten and the apple is standing stronger than ever. To learn more about the Apple company and to view some of their latest products visit the Apple Store.